Fantastic Oysters, photo by Gwenevere Young. Copyright 2000. Rita owns and manages her restaurant with lots of care and attention. Upon speaking with her, I learned that she is intelligent, hard working and a little eccentric. Rita's hard work has certainly paid off, her restaurant is a well known, popular and respected restaurant. Rita is a straight to the point kind of lady who tells it like it is, she says, "It is our feeling that there are two places to dine where you can be relaxed and comfortable in a heartwarming atmosphere. Your home and ours...Welcome to ours." The menu is well thought out providing fare for every palate. Fresh seafood, steaks, Italian pasta, duck, chicken and ribs. Literally everyone will find what their appetite calls for. 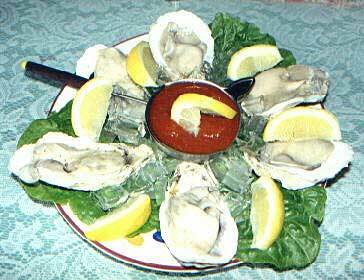 My companion and I start with Oysters on the Half Shell. They are fantastic! They are sweet and about as plump as I have found. They tasted as fresh as the ones I've enjoyed on the East Coast. Next we give the escargot a try. Anello's serves this dish the classic way; baked in their own shell, seasoned to perfection and arriving to the table piping hot. They are so beautiful I had to share a photo you. 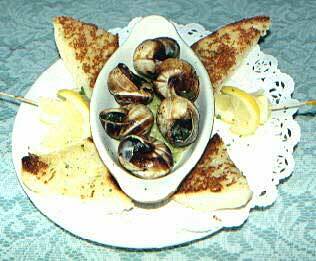 Escargot with Garlic Bread $4.95. Photo by Gwenevere Young. Copyright 2000. Anello's has a great soup and salad bar that comes with all dinners. The soups are homemade and the vegetables are cold and fresh. Even the croutons are homemade; one could make a great meal out of the salad bar itself. This brings us to the main course but we are already full, so we decide to wait a few minutes and take a look around. The restaurant had quietly filled up with hungry locals. Families with children as well as young couples leaning towards each other talking softly as if they are sharing deep secrets. The simplicity of the decor is very inviting and unobtrusive, everyone had one thing in common... they were all very comfortable. For dinner I ordered the fresh fish combination of the day, Red Snapper and Blue Marlin. 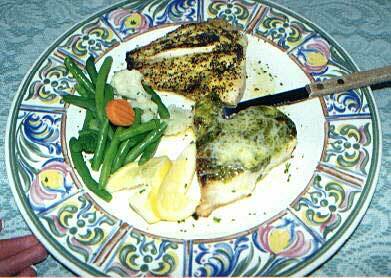 This was an excellent selection, the fish was seasoned lightly and cooked to perfection. At $9.95, this was as good of a deal as it was great tasting. My companion orders a a steak and rib combination that deserves lots of raving, especially the steak. If you are a beef eater try the Tenderloin, 8 oz. USDA Choice center-cut, topped with a mushroom demi. The Chef tells me that this is a Steer cut. It is out of this world good! Tender and juicy, just the way we all like our steak to be. The service, both at the bar and the dinning room is worth mentioning. I found the bartender to be warm and informative. Our waitress was quick with bringing our food yet gave us plenty of time when we wanted it. She seemed to know exactly when to show up at the table and when we needed more time to relax. Anello's Torchlite has a large menu, below is a sample of it.